I’ve never been much a comic book reader. I’ve never been into Marvel or DC (please don’t crucify me fandoms). The only comics I’ve read were manga and that primarily included Hiro Mashima’s Rave Master and a couple other random series here and there. 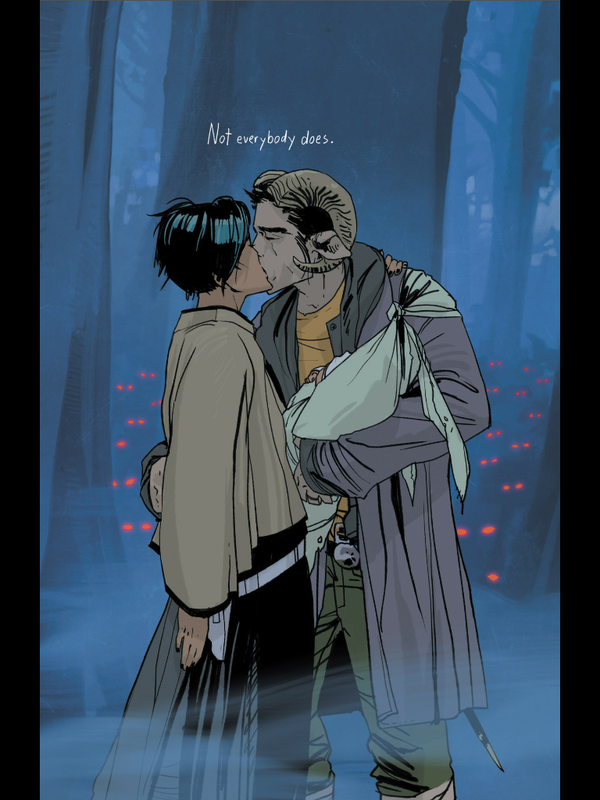 But for some reason, Saga caught my eye. Maybe it was the attractive interracial alien couple on the cover or the buzz coming through my Twitter feed, but even after I opened the first few pages I immediately fell in love with this series. Let’s start out with what this series is about. Marko and Alana are two fugitives from two different warring planets. Their races/planets are literally mortal enemies and their fighting has gone on for so long, that they contract out their battlefields on other planets. The problem? Marko and Alana fell in love, got married, and are now pregnant with a mixed-alien child in this violent war-torn world. And everyone is trying to stop them. The first volume horrified me…in a good way. One thing I love is that the book isn’t afraid to display violence and other explicit content, and it completely disproves that comics are for children. 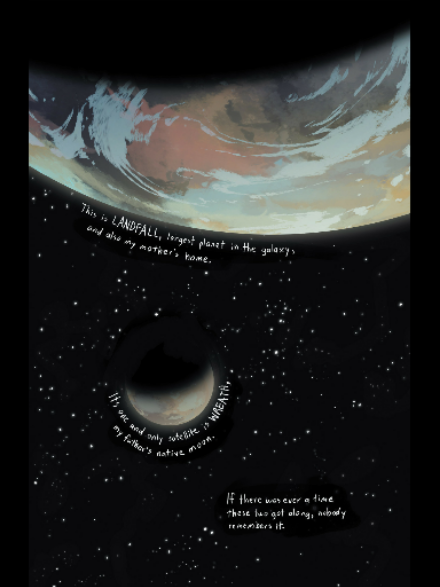 The artwork and colors are vivid and ragged in this graphic universe, which makes it very engaging. This science-fiction world is something I have never seen before. I often find that when science-fiction stories are created, we always see the perspective of the human race among the other aliens. That method is fine when done well, but the fact that all of these alien races are already intermingled, working and fighting one another in their established hierarchies is extremely refreshing. Mixing the aliens that use magic and the ones that rely on technology and science illustrates a great conflict and possibly the root of the beginning of this war. Hopefully, this will be explored later. Hazel, the narrator of the story, has a very snarky and clever voice. She does a great job of keeping moments lighthearted but also taking a step back and being more profound when the situation calls for more seriousness. I’m excited to watch her character grow and see her perspective intersect with the other characters so far. The diverse group of characters fill several storylines in this first volume. After Alana and Marko, there are the bounty hunters named “The Stalk,” and “The Will,” who is the owner of a unique lying cat creature. A mutilated teenage ghost and a royal android also join the cast as allies and enemies, respectively. One brilliant theme established throughout this first segment is the parents wanting to make a better future for their children. This principle is also relevant for the villains of the comic in their own unique and somewhat twisted ways. Marko and Alana struggle with their previous identities and values, and argue on the path they want their family to take. In the end, their love overpowers any of the obstacles they have. If there’s one critique I have of this series so far, it’s that there haven’t been enough horrors of war. There have only been a couple scenes of battles, but not enough for me to get a full grasp of the hatred between these alien races. I enjoy seeing the wonders and strangeness of this universe, but it all feels too lighthearted. Maybe it’s because Marko and Alana are trying to run away from it all. Overall, If you like science-fiction, aliens, and aren’t offended by extreme violence and explicit sexuality, this book is absolutely for you. I look forward to delving even further into this comic. The Fandom Jumper rates the first installment of this adventure 10/10.